When planning a home theater, you have many resources to tap for information. Magazines, catalogs, and Web sites offer details and advice on home theater systems — from planning and purchasing to assembling. Most publications allow you to purchase back issues of their magazines. Home Theater Magazine is one of the main sources for information about home theater. It’s a high-end publication that will expose you to a range of systems, from budget items to those on the finer side of home theater. And you can always find out about the leading trends in the industry, which is important because there’s nothing like buying yesterday’s technology on sale and thinking you got a great deal. The same folks also publish a dynamite Home Theater Buyer’s Guide Annual Directory, which lists more than 5,000 source devices, controllers, speakers, home-theater-in-a-box packages, video displays, and all sorts of accessories. Ultimate AV focuses on the high-end sector of the home theater market. The guide’s cadre of industry experts is dedicated to providing in-depth gear reviews on everything from projectors to line conditioners to DVD players to HD tuners. Columns, special features, and software reviews help you get the most out of your system. Playback Magazine has great reviews, how-to articles, and reviews on the stuff that feeds your home theater — namely, music and movie reviews. Playback’s online format makes it easy to skip between articles, search each edition, and even download, print, and share articles. If you’re willing to give up your e-mail address, you can have each new edition delivered right to your e-mail inbox every month. Sound & Vision is another respected home theater publication that captures the essence of home theater and its various components. This publication regularly has helpful articles in nontechie language about speakers, tuning, and more. The buyer’s guides are ample and feature checklists. Electronic House includes articles about all aspects of an electronic home, including the home theater domain. It is written for the consumer who enjoys technology. Although only a portion of each issue deals with home theater topics, Electronic House provides coverage of the key issues of the systems that make up a home theater, including audio, video, remote controls, speakers, wiring, and lighting. Crutchfield offers a free catalog of all sorts of A/V and home theater gear, and it’s great for just getting ideas about what’s out there. Its companion Web site is laid out very simply and offers a Home Theater and A/V Info Center. 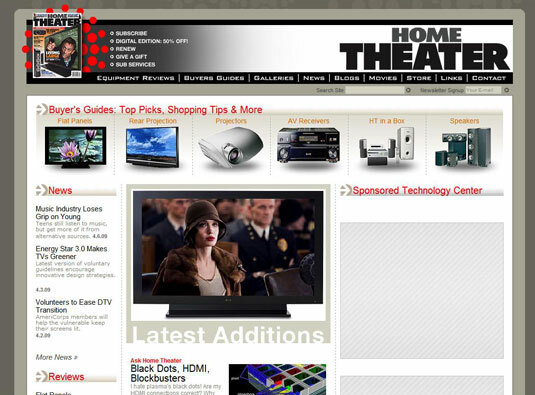 CNET is a simple-to-use, free Web site where you can compare home theater and electronic equipment. You can see pictures of what you are buying, videos of an editor playing with it, editor ratings of the equipment, user ratings of the gear, reviews of most devices, and a listing of the places on the Web where you can buy it all — including pricing from multiple online stores. It’s a one-stop resource for evaluating your future home electronics purchases. Home Theater Forum is a massive, Internet messaging site where people interested in home theater gather to discuss their issues and solutions. You can find areas for discussion of home theater basics, construction, DIY solutions, sources, displays, and so on. Almost any major retail store chain where you might purchase home theater equipment has a Web site. These sites often contain information centers about home theater and are a good stop before going to meet the geeks at the store.